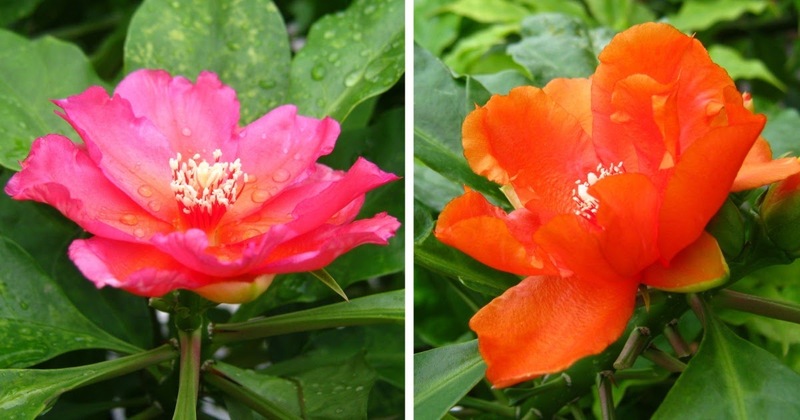 So how does a plant's flower change in color into a deep neon pink as shown on the left in the photo below, when just 3 days ago it was bright orange as shown on the photo at the right? This plant grows in tropical countries, by the way, where there are no seasons like summer and autumn. 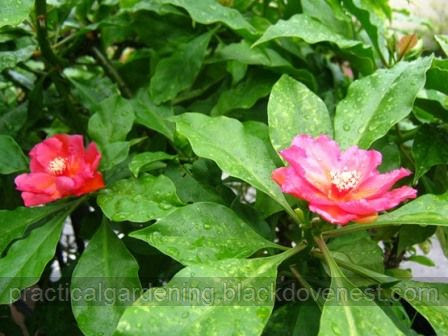 In a recent article, I've mentioned about the Rose Cactus or Pereskia Bleo plant that was given to us. It is the Rose Cactus flowers that are pictured above. 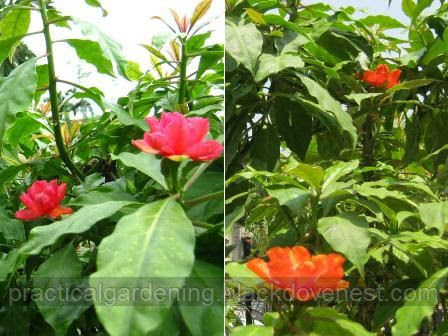 The flowers of this plant that grows into a big shrub are so attractively colored bright orange. And I've found a way to promote flowering by pruning and deadheading. Here's a photo of the flowering Rose Cactus shrub. This is how the plant ordinarily looks like on warm or hot days especially during the dry season. The color of the flowers is a bright orange. Against the backdrop of glossy green large leaves, the flowers almost automatically generate curious interest from passers-by. The photo above was taken in June. June is a month where the rainy or wet season would have started. Rains usually start at the latter days of May. After a three days of intermittent rains and cool weather, I noticed that the Rose Cactus flowers began to take on a different hue. It is like a shade of magenta or deep pink. These are one-day flowers, by the way, and and when the orange blossoms have dropped, they were replaced by the pink flowers within that 3-day abrupt change into cool weather. In fact, you can still see the water droplets from the rain on the leaves in the photo below. What is this phenomenon? How does it happen? With all pigments, the more pigment the flower produces in the bud, the brighter its colors will be. With carotenoids, a little bit of pigment makes a soft yellow flower. As the pigment levels increase, flowers become increasingly vivid yellows, oranges, and reds. Carotenoids increase production in response to heat and lots of sun. The hotter and sunnier the weather gets, the more carotenoids a plant produces, the brighter the oranges and reds will get. When weather cools off, carotenoid production decreases, and colors become softer oranges and yellows. High temperatures and bright sunlight also enhance carotenoid production, leading to bright reds and oranges. On the other hand, plants produce more anthocyanins in cold weather, and the anthocyanins they produce tend to be more red- and pink-colored as opposed to blue or purple. 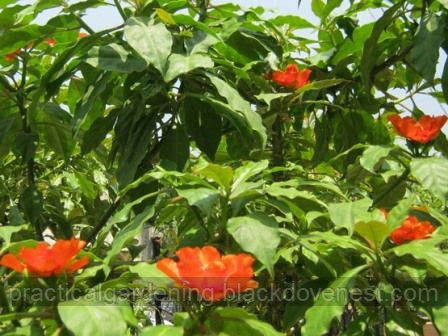 For this reason, some anthocyanin dependent hibiscus flowers will produce brilliant color displays during cool weather or in partial shade, but will fade in bright, hot sunlight. So I suppose the plant's behavior above explains why there seems to be a wide variety of flower hues available for the Rose Cactus or Pereskia Bleo when searched on the internet. The plant itself, through its pigments, is able to display different colors depending on ambiant sunlight and temperature.